I climbed a mountain, and found a ski movie actress from Russia on the top! I met with Катя Коровина (Katya Korovina) and Алексей Логинов (Alexei Loginov) from powderday.ru on their mission to shoot a short movie from Les 3 Vallees for Russian viewers. Katya is Russia's #2 free skier, and judging from what we saw, Alexei is also an incredible skier. We went up the Rocher de l'Ombre, a small peak between the Grand Couloir in Courchevel and the the Saulire gondola ground station. 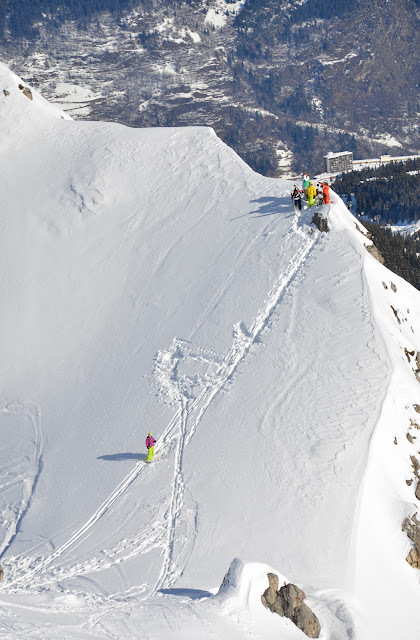 The Rocher de l'Ombre ski lift ends at the bottom of this peak, but it is best to approach the peak from above, by taking either the Saulire or Grand Couloir ski runs. After coming down the Grand Couloir, turn slightly left to reach a pass between the towering mountains and couloirs on your left side and the smaller Rocher de l'Ombre on your right side. 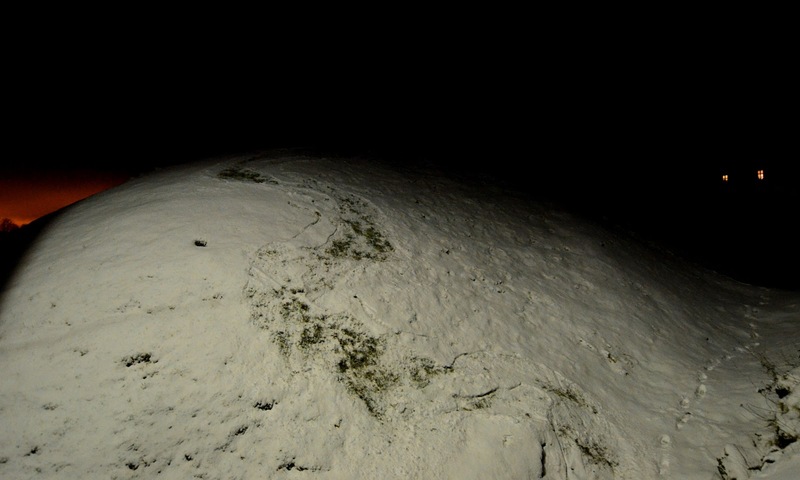 I think the Russians intended to ski the other, front side of Rocher de l'Ombre, but when I peered over the knife edge ridge, it just looked too rough for anyone. Mostly rock, only patches of snow. In the end, the film crew skied the backside just like I did. As a side note, this area is some of the best off-piste skiing in Les 3 Vallees, at least when considering areas that are easily accessible and visible from the ski runs. The Grand Couloir is true to the normal use of this name and is the easiest run. I wish I'd have had time to do it, though. I have done the Sous Pylons after a big snow dump, and it was incredible, if short. Perhaps I will have them on some future trip to do all the couloirs that are easily skiable. 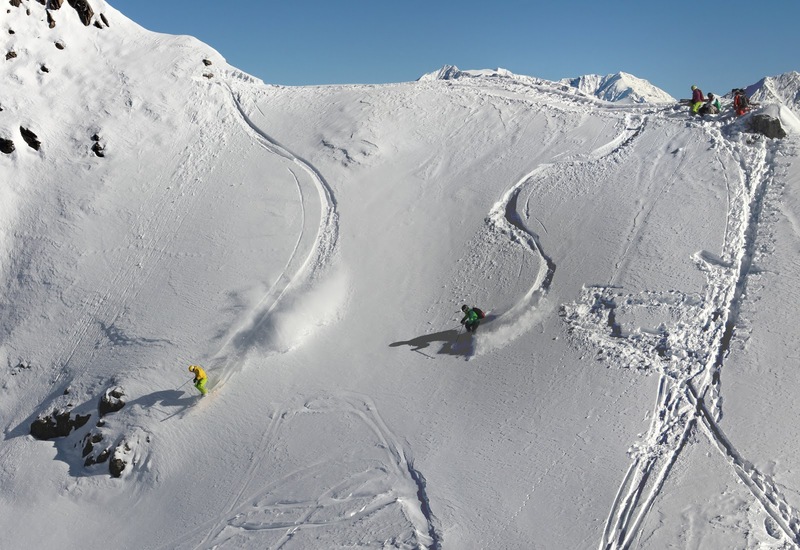 This link gives an excellent overview of the couloirs in the Saulire area. 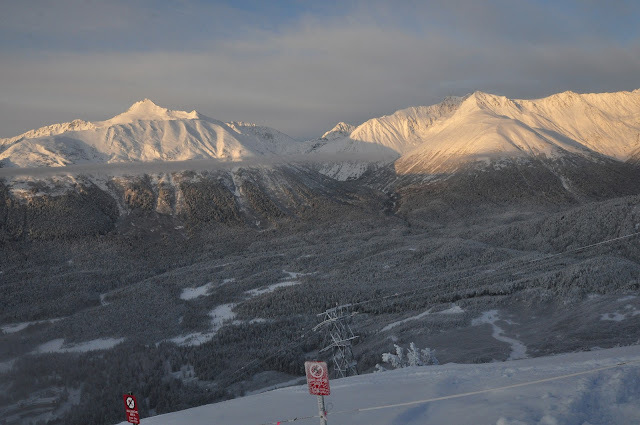 Here is one video from Powderday.ru. Incredible skiing! 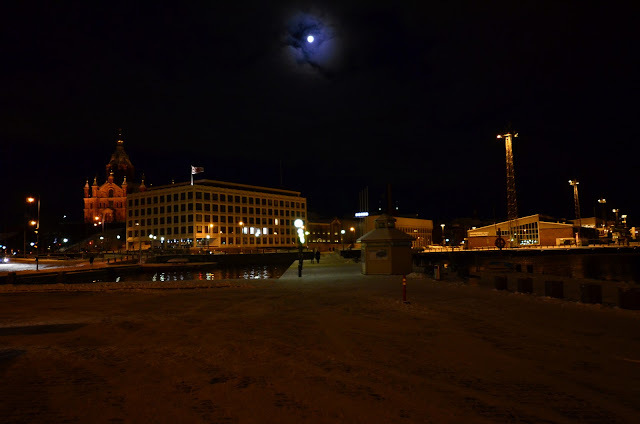 Photo and video credits (c) 2012 by Jari Arkko and Ari Keränen. Vimeo video credits by powderday.ru. France. 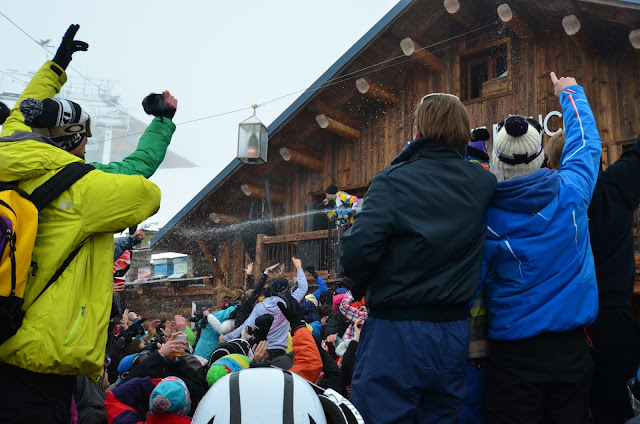 The traditional wisdom is that France is not the country for great after-ski. The Austrians can do it. The Swedes can do it. The French can not. 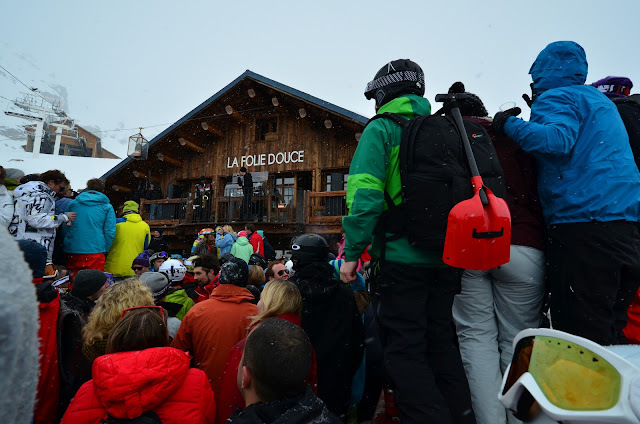 Except in La Folie Douce, situated a lift ride above Val Thorens at 2600 meters. This bar boasts to have the dance floor on top of the world. There are higher dance floors elsewhere, but not with this kind of action and intensity, or with the crowds. Even on a mid week bad weather day in off-season, their large terrace is packed. On a better day even the nearby hills fill up with people who want to join the party and listen to the music show. 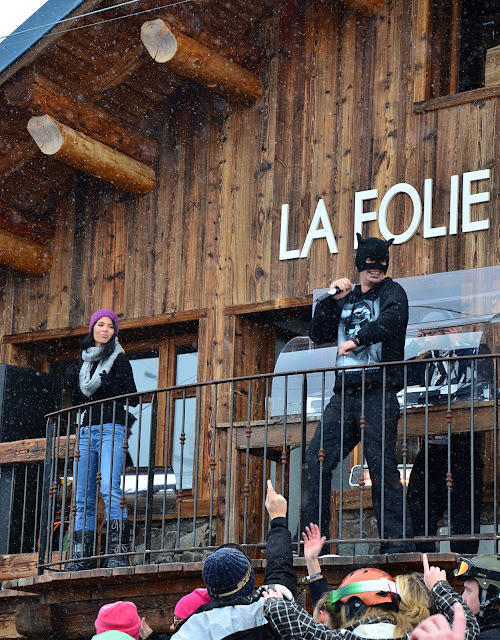 When we asked around for after-ski recommendations in other Les 3 Vallees villages, we got blank stares. 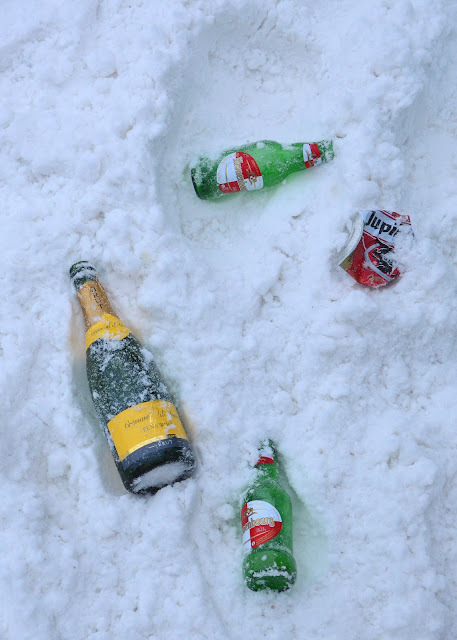 After-ski? 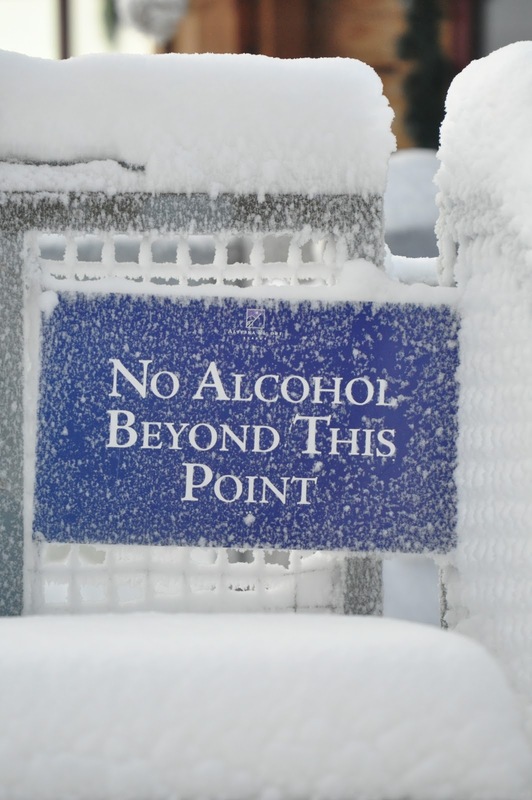 Even the bartenders in our own village said that they did not know any good after-ski places. How can a bartender not even suggest their own bar as a good after-ski place? 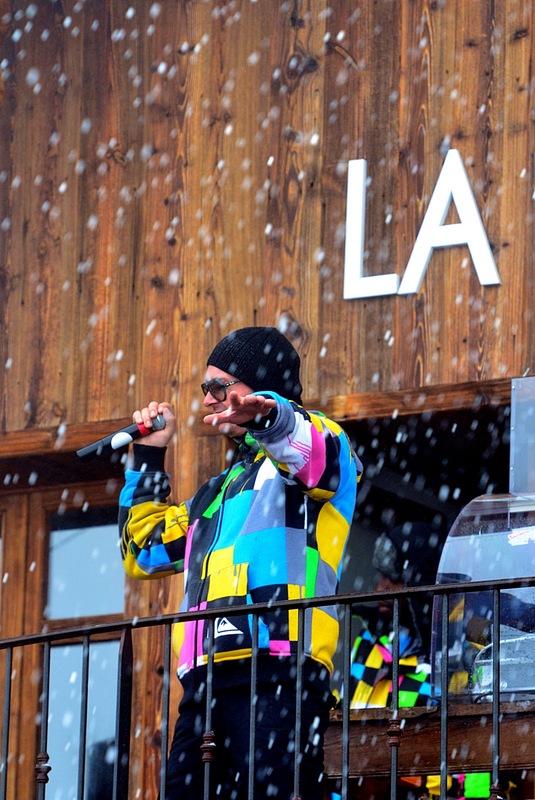 This just shows how bad after-ski is in France. However, after a while a pattern started to emerge. 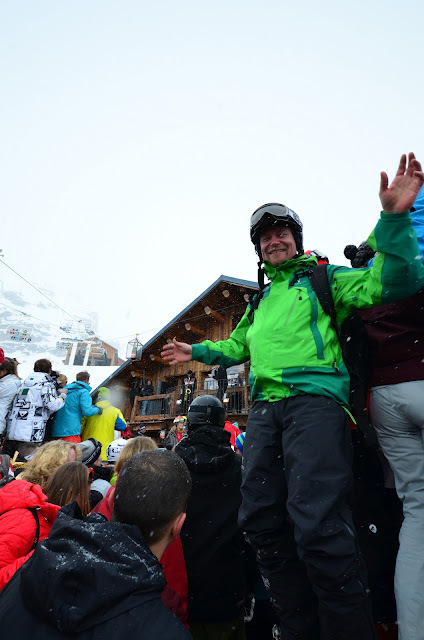 Most people that we asked from pointed us towards Val Thorens. 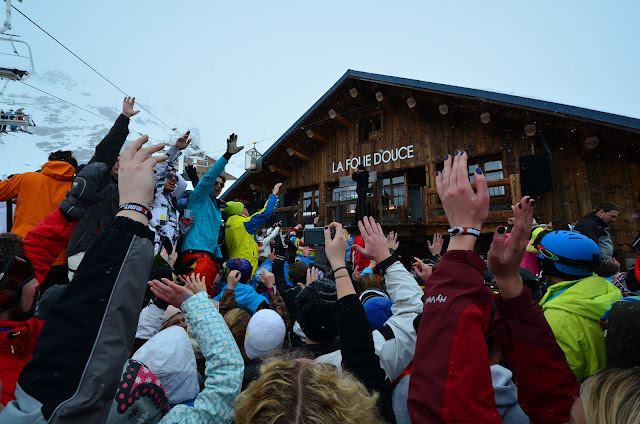 The Internet told us that La Folie Douce is the place. As we descend towards the site from higher up in heavy fog, we can barely see the next piste markers. But the music begins to emerge from the fog. We no longer need the markers, we can just ski towards the sound. Me, dancing on a table. Sort of. 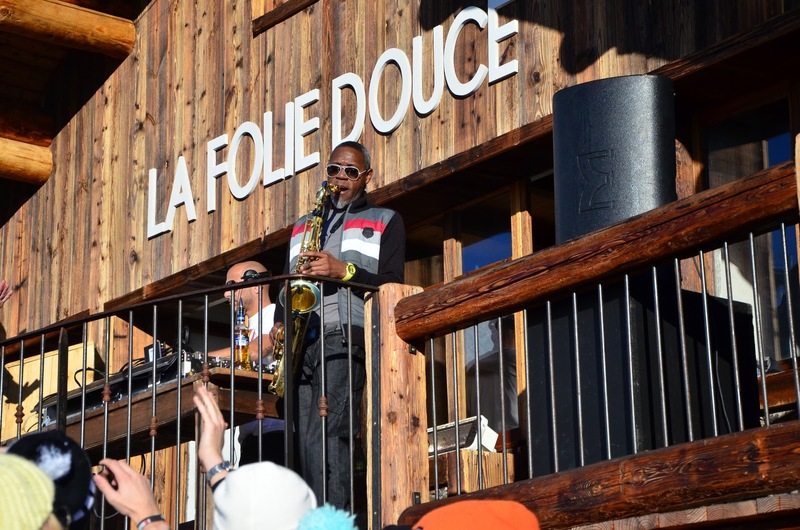 La Folie Douce runs a music show complete with singing MCs, saxophone players, dance girls, and champagne showers. On our visit, Mister FLUOOOoooh was acting as the MC and Fabien Kisoka was on the sax. The dance girls are from the audience. Action on the Dance Floor. Table. While La Folie Douce is at 2600 meters, the dance floor is in practice at 2601 meters, given that most of the people are dancing on tables. The tables are extremely slippery, however, particularly for ski boots. I was not afraid of falling while skiing on my trip, but I was afraid falling down from the tables. I was glad that I had a helmet on, but I missed my back protector. Oh well, at least I had my big backpack (complete with shovels and other necessary bar gear) with me. And if you decide to stay on the floor for safety, be aware that there might be stage divers to the crowds below or falling table dancers. And since about half of the dancers seem to be hanging on to bottles of alcohol, there is always the danger of beverages raining on you. I had my new camera tested here for beer-proofness. The test passed. There's usually someone either on stage or on the floor who strips semi-naked. I decided to not include too many of those pictures or videos on this blog, but you can find plenty of material about this place in the Internet. 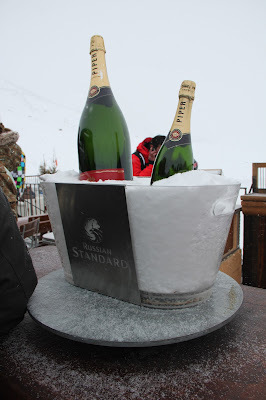 Proper equipment for the after-ski? Entrance to the bar is free, but they occasionally check backpacks for alcohol. The checks seem inefficient, given the number of people drinking from their own hard liquor bottles. 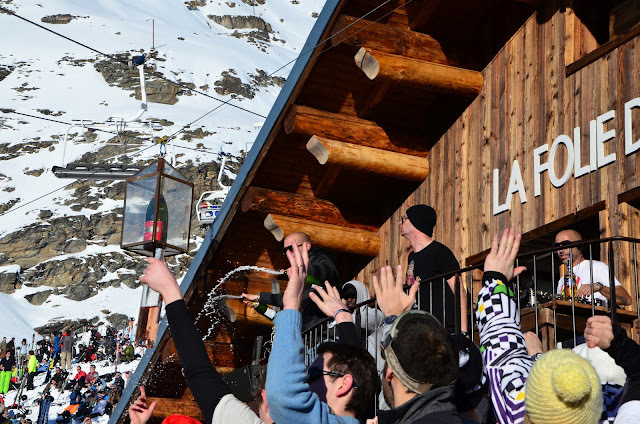 You should also be aware that since the bar is not in the village, people have to ski back to Val Thorens, often after having spent a couple of hours drinking that hard liquor. This presents some dangers. On our exit from the bar we were hit by a stray snowboard. Luckily no one was hurt. Be aware of the dangers, however, and look around you. Do not stay in this area longer than you have to. Are you ready? Are you READY? ARE YOU READY? 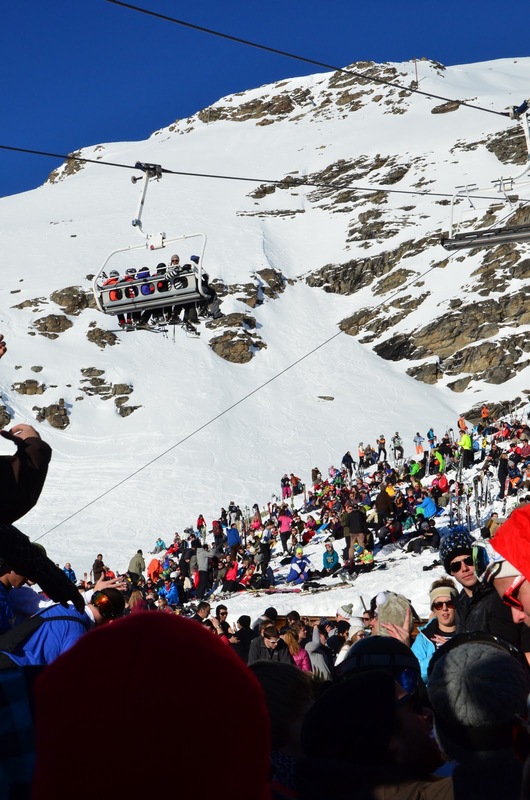 If you are not staying in Val Thorens, getting back to your own area is a problem. 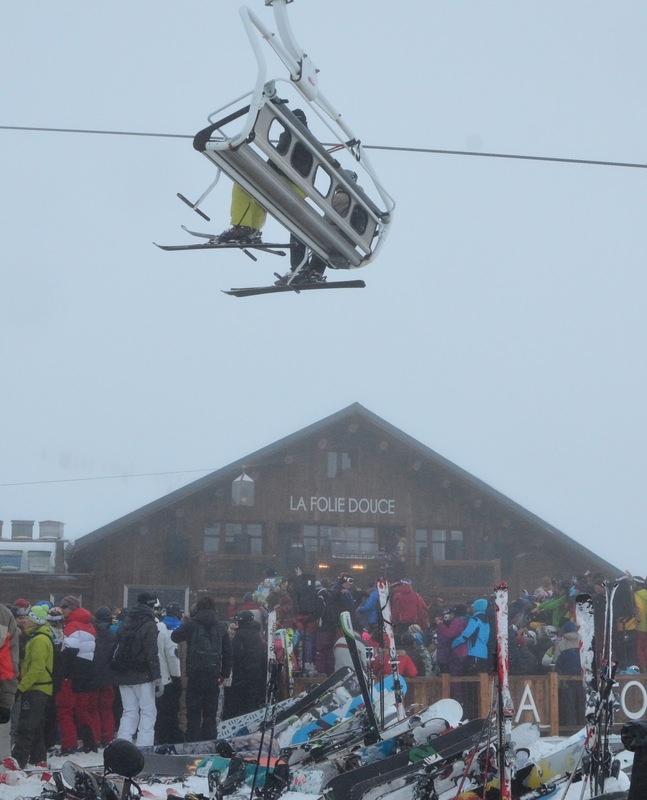 The Bouquetin telecabine starts next to the bar, but the last run is at 4:30 pm. You have to take this if you need to get back to Meribel. There is no backup bus transport, and the taxi for that 60 kilometer trip will be expensive. 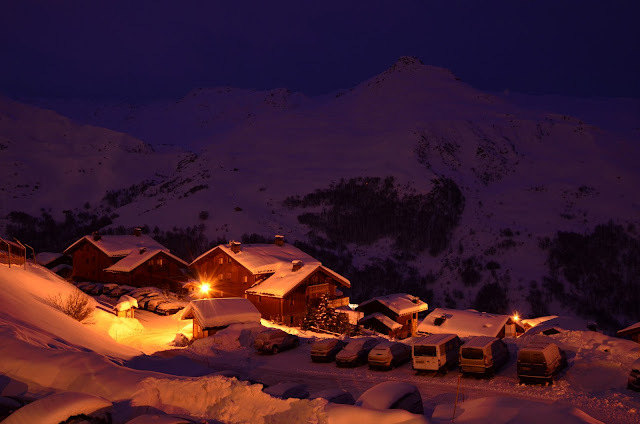 If you are staying further down in the valley, for instance in Les Menuires, then you can ski down from Val Thorens by taking the Plein Sud, Cairn, and Bd Cumin and ski trails. Even then, if you leave when the bar finally closes, the darkness and an army of snowcats may make the trip uncomfortable. 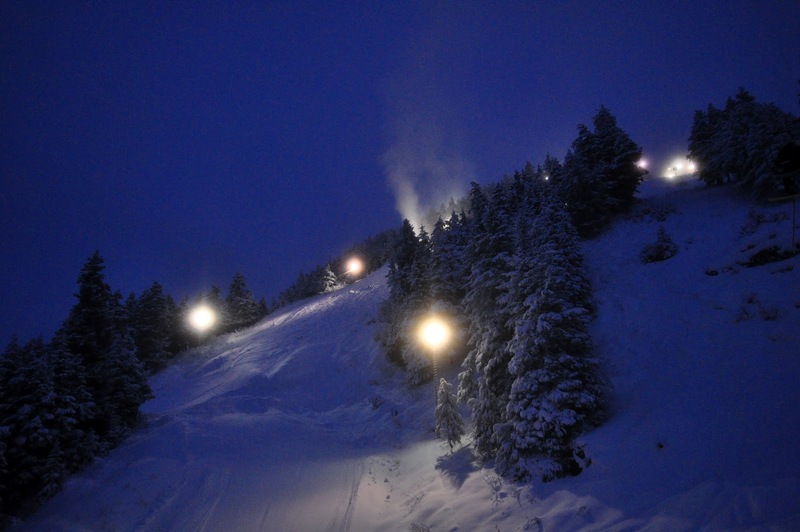 In addition, when you reach Les Menuires you will be at the bottom of the valley and the lifts will not be operating. 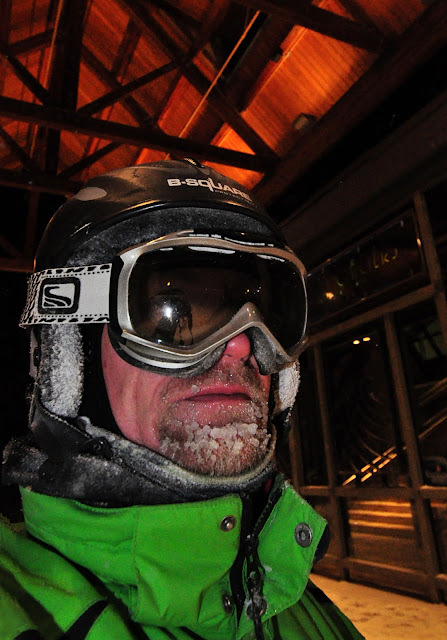 My recommendation is to step up to the road near the Reberty and Masse 1 lifts and wait for the local bus. This succeeded for us on two nights out of three. On the third time my friends had to walk up an hour to reach our cabin. Another option for going back to Les Menuires was to take the Bouquetin ski lift and then ski down either the Alpage or David Douillet ski runs to reach the different ends of the Les Menuires village. The party begins at 2 pm every day, and runs until about 5 pm. Champagne glasses are 10 €, beers 6 €, diet Cokes 5 €. They also serve food, but I did not try it. There is also a VIP area for those guests that prefer to pay more and avoid the crowded terrace. This is the place for after-ski in Les 3 Vallees and even the entire France. Possibly the best after-ski place in the world. 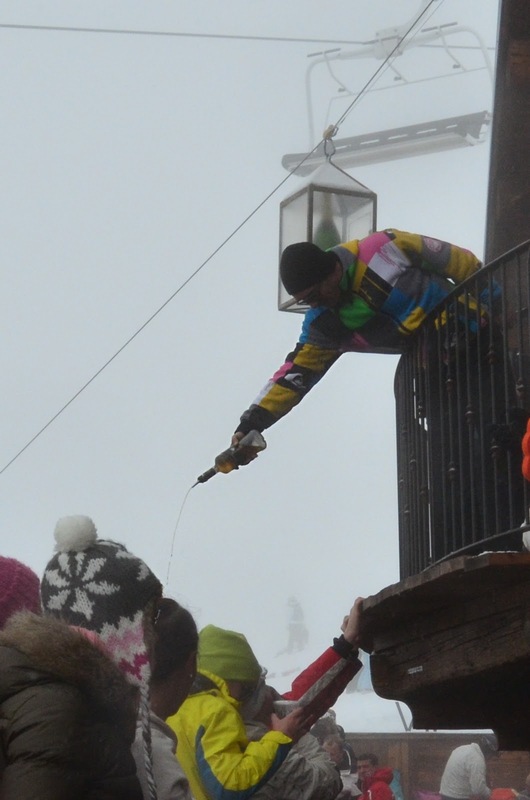 I certainly have not seen anything like this before, but I confess that I still have a few after-ski bars to test. You might want to go to Val Thorens just for this, even if you don't care about the great skiing in the Les 3 Vallees area. 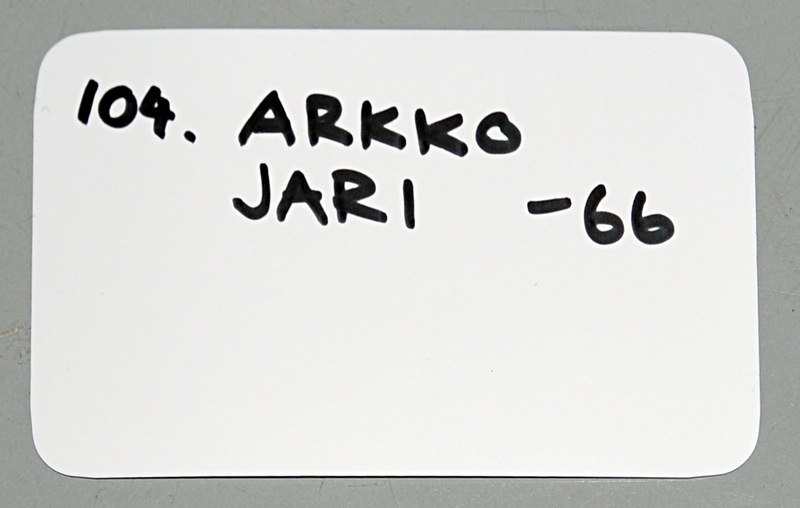 Photo credits (c) 2012 by Jari Arkko and Ari Keränen. Video credits by Jari Arkko, La Folie Douce and Vimeo. 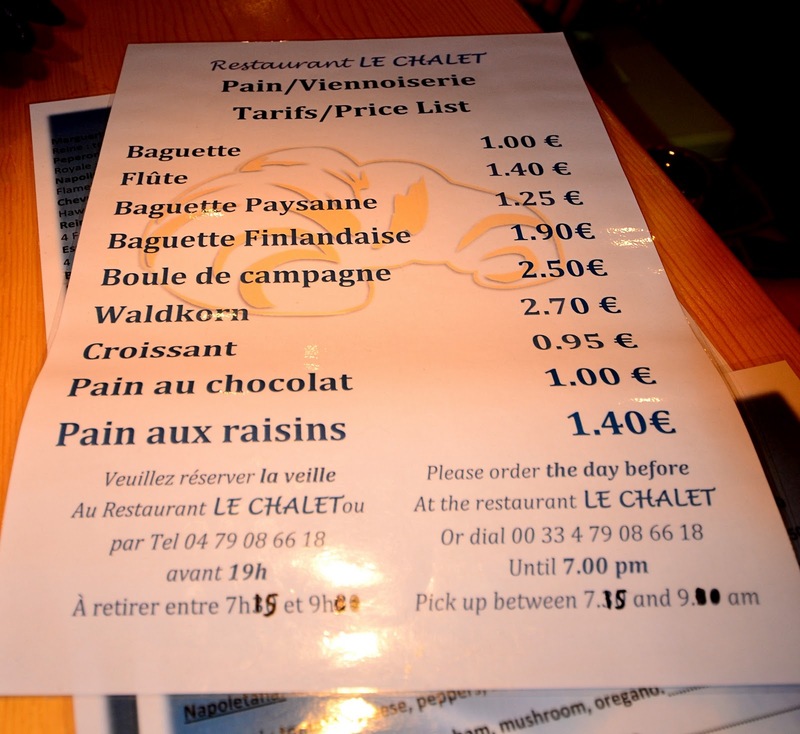 "Baguette Finlandaise": costs more, otherwise the same? I have a seasons pass! ... for Kauniainen. Getting one makes sense if I go to my local hill at least ten times this season. I'm thinking that if I have a ticket I'll be more likely to drop by in the evenings, instead of going swimming or walking. That's a good thing, as I have realized that I need to get into better shape and do more sports on a daily basis. Being able to ski will help with the motivation for that. But as I went to the ski slope today, I was scared more than I have been in a long time. Not due to dangerous off-piste adventures ahead, but due to testing gear. I have a new helmet, new pants, and most importantly, new touring skis, boots, and skins with lightweight but suspicious looking Dynafit bindings. I did not want to blow a knee when I have two big ski trips coming up in couple of days. I've never skied with Dynafit bindings before, so this was a first. And the system is indeed worrisome. 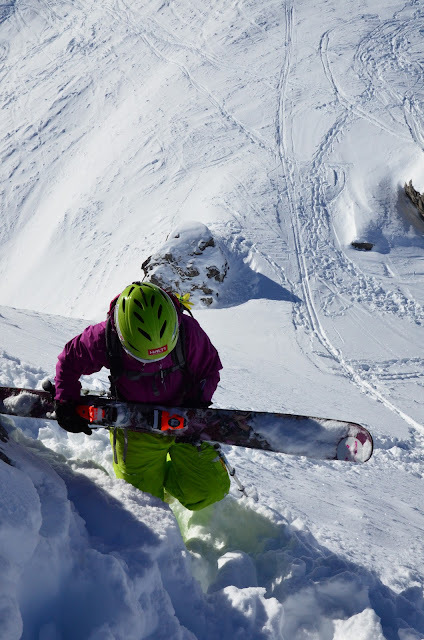 According to Dynafit, this particular binding is "the lightest freeride binding in the world", at only 530 g per pair. I do not plan to ski on these skis normally, they are reserved for those occasions where I have to climb up big mountains on my own. They are optimized for that, not for descents or for aggressive skiing. Go up light, come back carefully. As expected, I found that going up with the new skis and skins worked well, never had it so easy before. The skins stick to the skis perfectly, yet I can edge where needed. Going up steep slopes is no problem. And it felt effortless. Granted, Kauniainen is only 50 meters high, but still. The downside, however, is that the bindings are not as adjustable and flexible for ski release for the downhill part. I realized that I still have some work to do to learn how to adjust mine in the right way. Another downside is that the Dynafit system is not compatible with usual boots and bindings. So whenever I take these skis, I also have to take special boots. Unless I'm particularly planning to just climb big mountains, that usually means taking two sets of skis and boots on a trip. I was also scared for another reason. 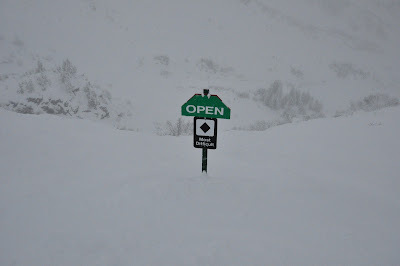 The slope opened yesterday and I had understood that even today they would not be open until later in the day. This would work well for me, as I could go up without having to worry about the hundred kids from the ski school. However, as you know I've been visiting this ski slope at inappropriate times before, and a couple of days ago there was a serious accident when some drunken person went to the ski slope in the night, and, after attempting to climb to a moving snow cat, was seriously injured. The ski area personnel might not look so leniently on off-hour visits any more. I hope the injured guy recovers well. And to all kids & stupid adults (like myself): lets be careful out there. Use your brain. Stay away from moving machinery, avalanche-prone slopes, cliffs and anything else that might hurt you. Stay in control at all times, know what you are doing, look around, and go slow when needed. Even on open slopes. And use protective gear, for your head and back. Fortunately, the area was already open by the time I got there. My new helmet is Atomic Xeed. It replaces a helmet that I bought for 30€ from Lidl that is getting too worn out. But it was a surprisingly good helmet, nevertheless. The new pants are replacing my Halti pants which, after 15 years, have too many holes in them. Strictly speaking, the skis are not new, I already bought them some months ago. But this was their first test. 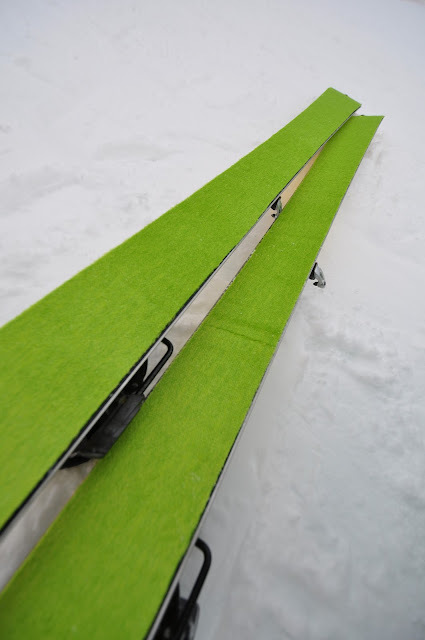 I also had my ski shop modify the K2 "Backside - tools for adventure" skins for the K2 superlights. These skis are an old, lightweight and narrow ski model and the new skins do not normally fit them. Moreover, K2 skins have are not easily modified as they attachments are sewn. But the shop found some spare parts to make the modifications. The result was very good. If you are looking for an expert ski shop in the Helsinki area, Skiservice should be your choice. And big news on the food side, too! 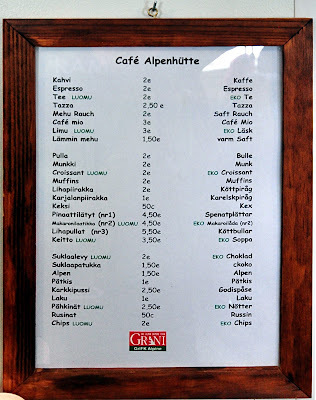 This year, "Cafe Alpenhütte" has soup in their menu. At 3.5€, their Goulash index competes well with most western ski areas. Take Zillertal in Austria, for instance. They may boast a 1600 meter vertical compared to Kauniainen's 50 meters, but hey, even if Zillertal is one of the cheapest places food-wise in western Europe, their soup still costs 1€ more than in Kauniainen. As this cafeteria will also serve "pinaattilätyt" (spinach pancakes), "makaronilaatikko" (macaroni casserole), and luomulimu (ecological soft drink) it is clearly the destination for the gourmet traveler. This makes absolutely no sense. Spending four hours to make one run down a hill of ten meters. And destroying my skis in the process. Yet, it makes perfect sense. 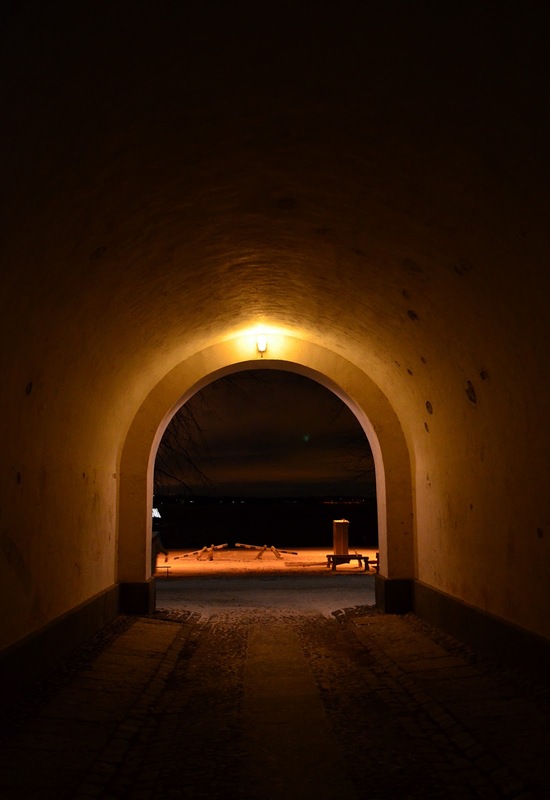 I am in Suomenlinna, a fortress island outside Helsinki. Suomenlinna is one of the most beautiful places in Helsinki and a particularly good place for photography in snowy winter nights. Moreover, I really needed the exercise and I could not motivate myself to go out to the darkness unless there was something interesting. Finally, I have not skied in Suomenlinna yet. I could add it to my list. And grow my list of vehicles I have used to get to slopes. That list already contains shoes, snowshoes, skis, cars, trains, ski lifts, snow cats, helicopters and horses. But no boats. The fortress islands are a preserved, UNESCO world heritage site with fortifications. Their beginnings date back the year 1748, when the construction began. 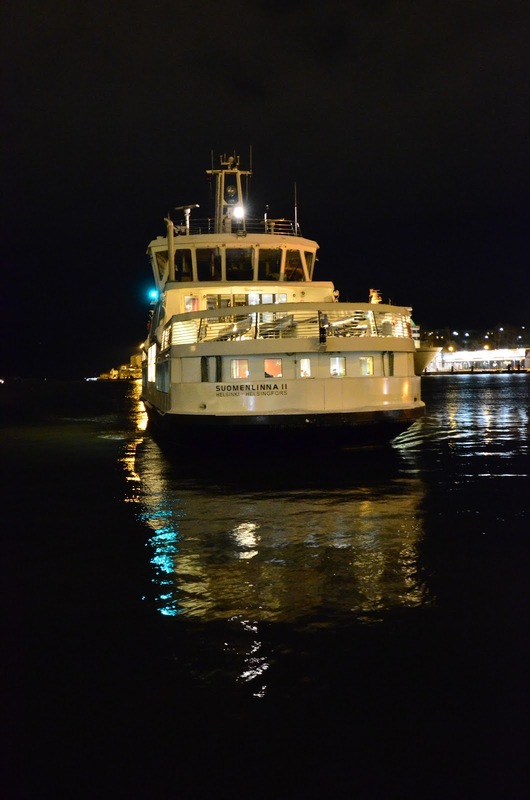 Regurlarly scheduled boats - part of the city public transport system - take you to islands for 2.20€. In the summer the islands are a green oasis full of tourists. In the winter... they are a dark, lonely and cold place. My kind of place. I see a few people near the harbour, but there is absolutely no one else on the big island that has the hills. Except a few lit castle windows. Probably one of the few people who live here. Or maybe a ghost of a dead soldier. Or a guard that is about come and stop me. There are small hills on the biggest island, the Susisaari/Kustaanmiekka area. Most of the hills are man-made, the one that I skied houses a bunker, for instance. Highest altitudes from sea are around 20 meters, but my hill was only about 10. 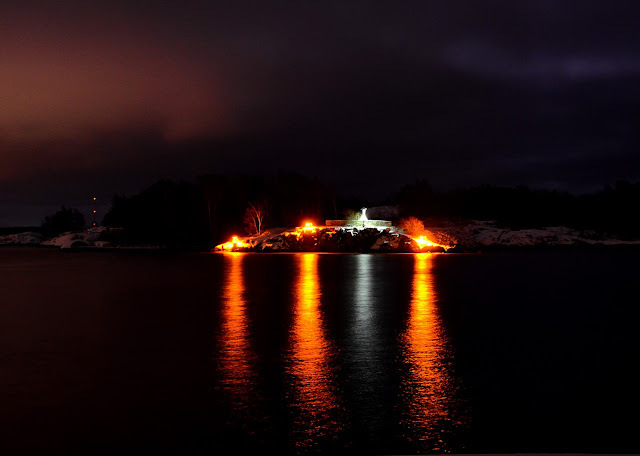 Since this was the first day that Suomenlinna had snow this year, snow cover was ... minimal, maybe 3-4 centimeters. I thought it would be enough to ski on the grass, and the hill that I chose seemed optimal for this purpose. But when I made my first turns on the steep part of the hill there wwas a loud screeching noise. My skis would soon require servicing, again. I wonder if there's any material left in the bottom of my skis. Even my small hill was interesting, very steep. But with more snow, there would be far more interesting skiing and snowboarding places. 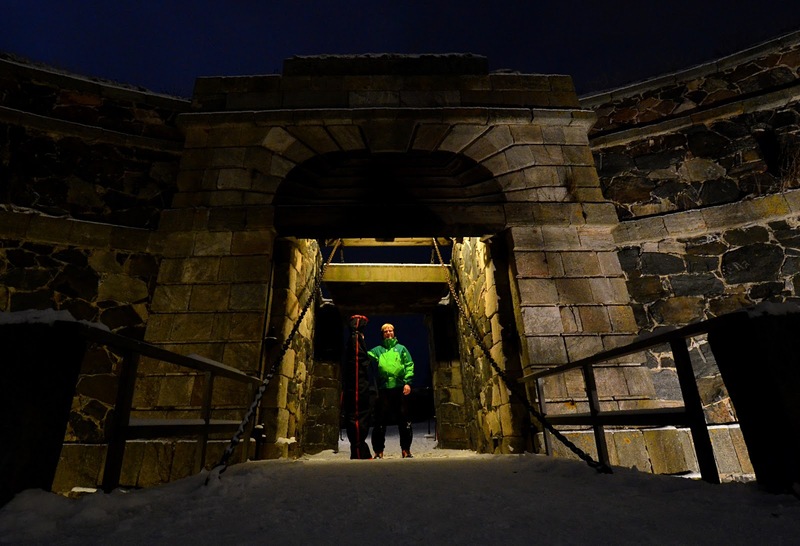 You could ski the rocky hills towards the sea, jump from the fortifications, and do many other interesting tricks. Take powder skiing pictures as you ski through castle window holes, ski in front of huge cruise ships, etc. Maybe I should come back when the winter gets really going! A warning is necessary. Suomenlinna is a dangerous place. There are natural cliffs, man-made sudden drops (such as grassy field suddenly ending in a ten meter fall), rails, old gun fittings, sea, slippery rocks. 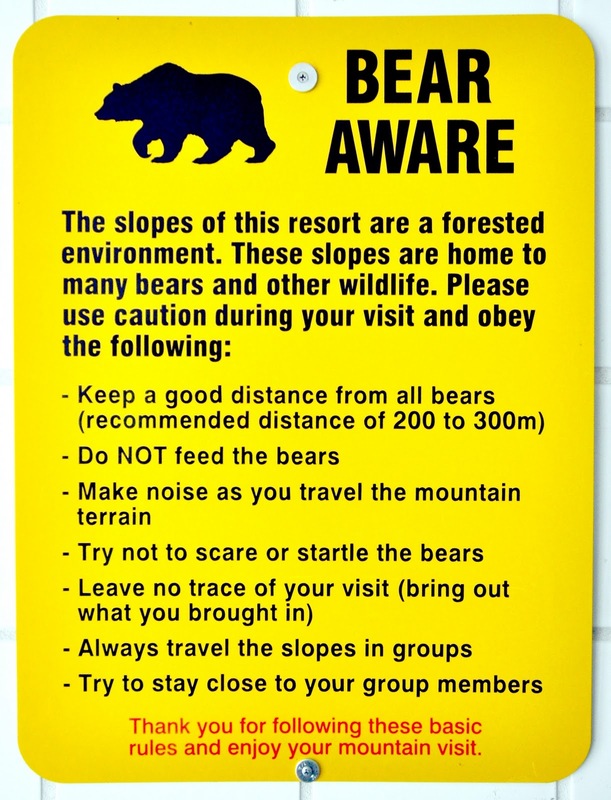 If you come here to ski, or even to just picnic, please be aware of your surroundings. Watch your kids. There aren't too many other skiers, if any. Or ever. 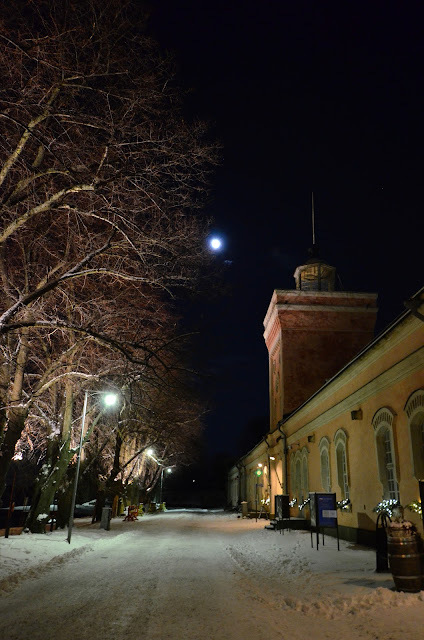 But Suomenlinna has a nice restaurant, Suomenlinnan Panimo. They brew their own beer and offer reasonably priced meals. 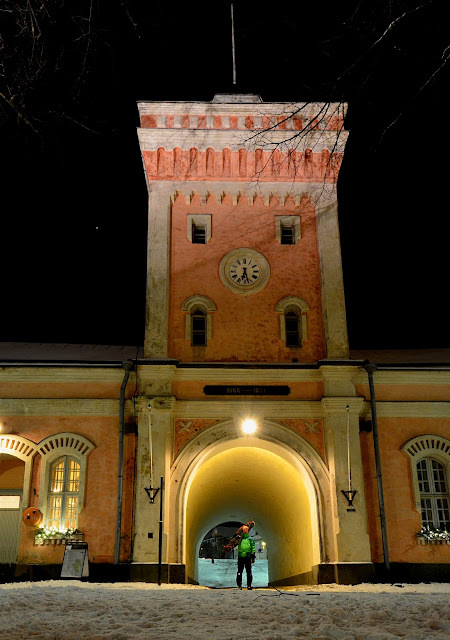 An extremely pricy restaurant, Walhalla, is on the Kustaanmiekka area. However, I can recommend the Siwa shop near the harbor for most purposes. A picnic meal in the island is the greatest option, at least when the weather is nice. Alaska. My friend TJ was surprised that I would fly as far as Alaska to do a side tour on my round the world business trip. I told him that from my perspective, Alaska is close by if I'm already stopping in California. But as I was sitting for sixth hour in the Alaska Airlines plane bound for Anchorage it started to dawn on my that TJ may have had a point. Alaska is far away. But the moment I stepped out from the airplane I felt like home. The air outside tasted frosty, snow made everything beautiful, the cars were making the same noise as they traveled over frozen ice contours in the road. And the same dark emptiness, not many people around. All this is like Finland. No, I take it back. This is how Finland should be. Better than home! None of those global warming signs. Realiable snow for Christmas. Reliable snow for November. 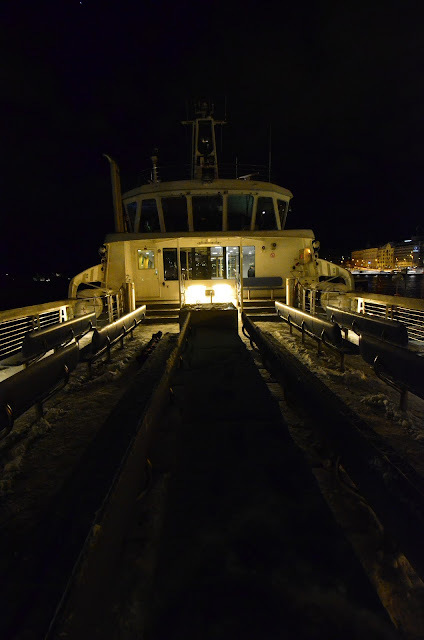 The Christmas part seems exceptionally important, as I am writing this blog couple of days before Christmas and its noon, it is dark, and it is raining heavily in Kauniainen, Finland. No, Alaska is better. I did not change my mind about this even when another friend told me that Alaska is the redneck capital of the world. I felt I fit in nicely. What was his problem? The state is known for intelligent educators who can simply complex topics such as history or the Internet ("series of tubes") for the common man. But back to skiing. I was destined for Alyeska, the top ski resort in the state. No, make that the only ski resort in the state, at least if you only count large ones. 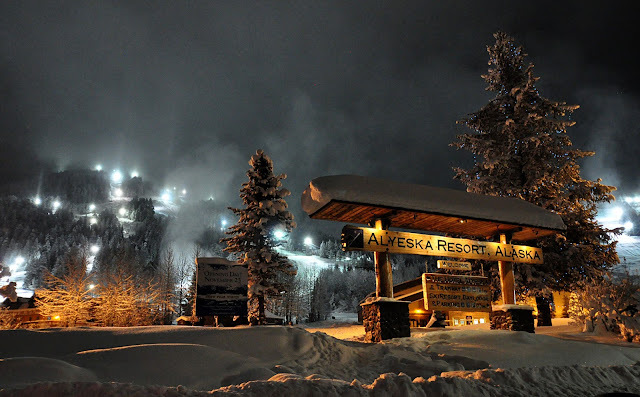 There are a few small ski areas, but Alyeska is the only large commercial operation. Then there are of course countless mountains to take on your own or with the assistance of helicopters, snow cats, snow mobiles, or dog sleds. My long business trip had made me too tired to even consider such extreme activities so I was headed to Alyeska instead. Actually, to be honest, I did ask but all such operations were still closed at that time of the year. Alyeska sits on the famous Chugach mountain range, an hour's drive from the Anchorage airport. 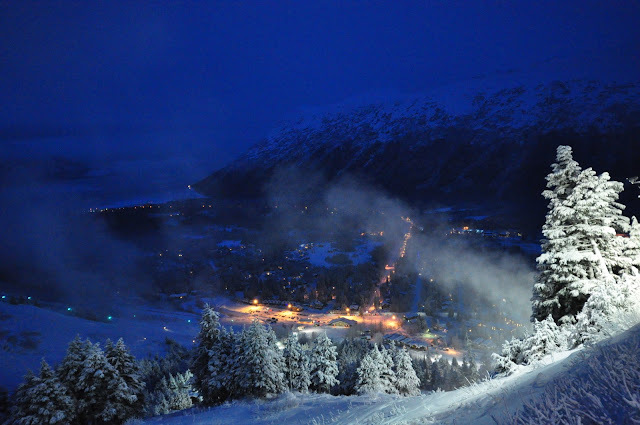 The village is close to sea level but next to Mount Alyeska. It has 760 meters of lift-served vertical. A kilometer if you are ready to hike to the Headwall. 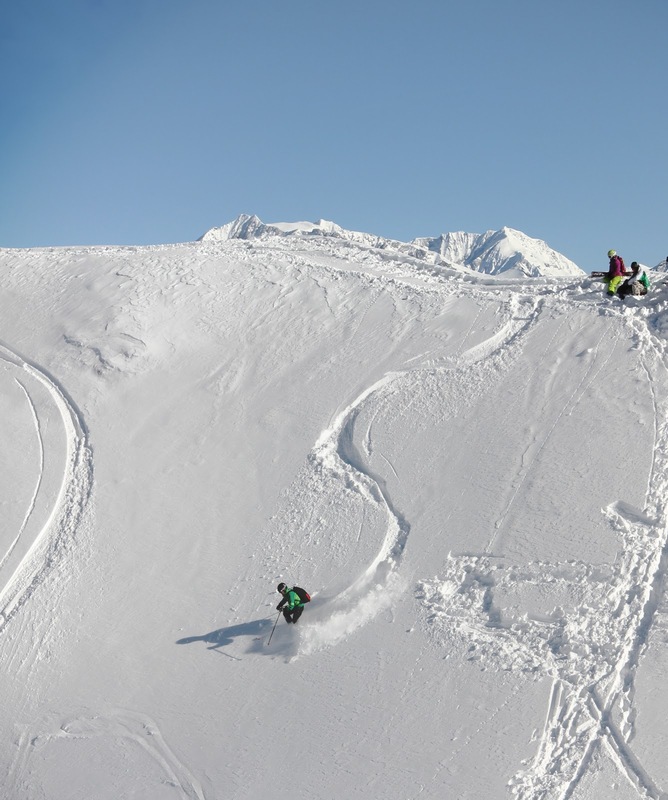 Alyeska gets over 16 meters of snow on the average, per year. This snowfall was very visible on my visit. It was the opening day for the ski area, and I was worried they might delay the opening. But there was plenty of snow, including half a meter of powder that had just arrived. 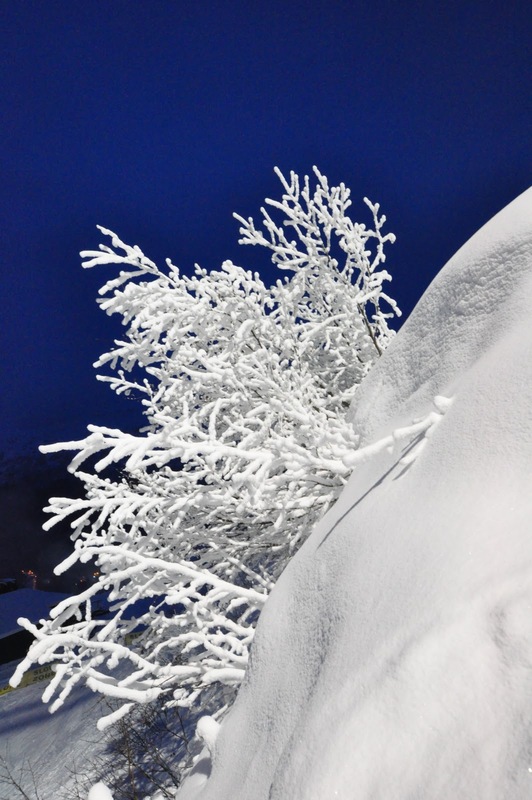 On subsequent days we got a daily dose 20 centimeters of fresh, dry powder snow. Alyeska has one gondola from the base on the Alyeska hotel side to almost to the top of the mountain, only Chair 6 runs higher. This is a good for the first-lift-of-the-powder-day or for bad weather days, but otherwise the chair lifts are a faster way to get up the mountain. There are altogether only six chair lifts and two magic carpets, but the lifts still lead to over 70 different runs. 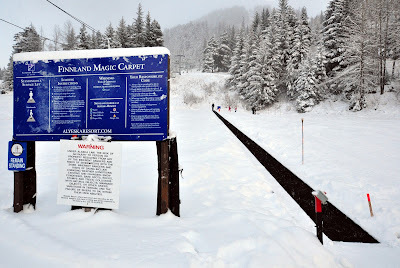 My love for Alaska took a big hit when I saw one of the lifts, the "Finnland" magic carpet. They named the kids lift according to my country, and with two n's to boot. 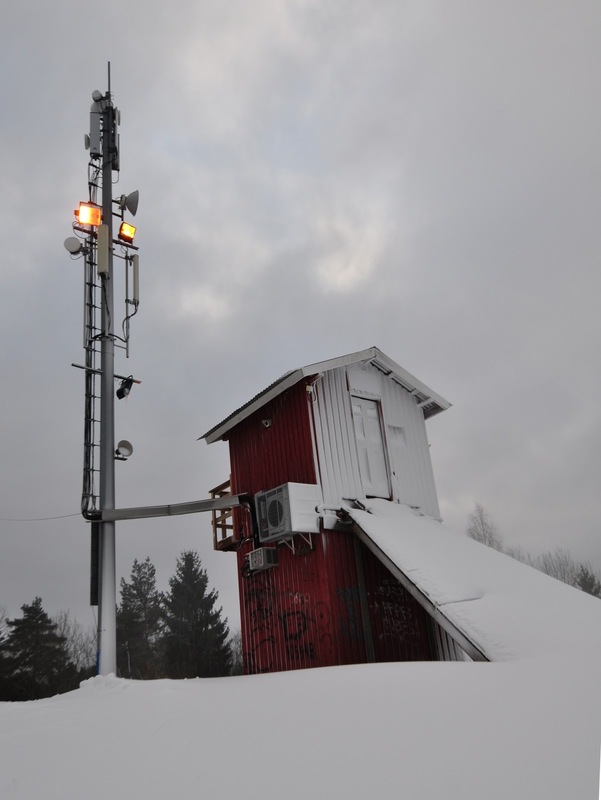 You could argue that the small lift was roughly the size of the biggest ski hills in Finland, but still. I'm expecting the diplomatic ties between Finland and Alaska to be broken any day now for this. Or maybe a quick military invasion? Alaska is kind of disconnected from the rest of the US anyway, and together Finland and Alaska could form the strongest nation of rednecks in the world. 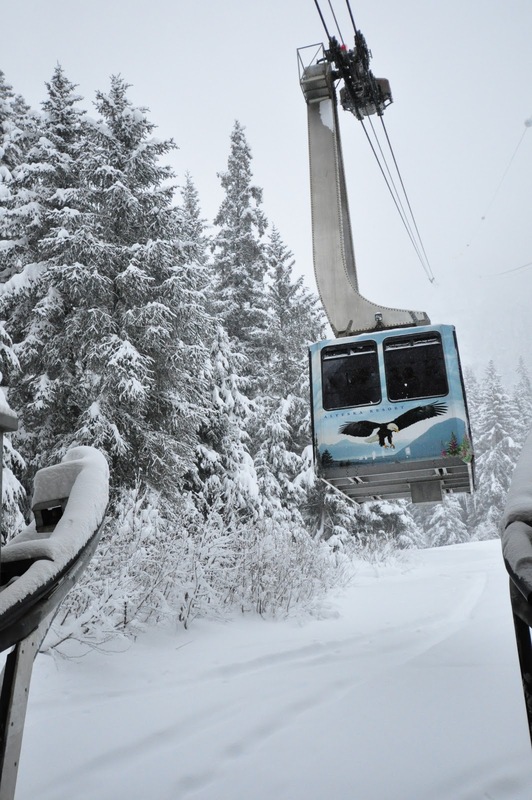 And be much smarter about naming our ski lifts. 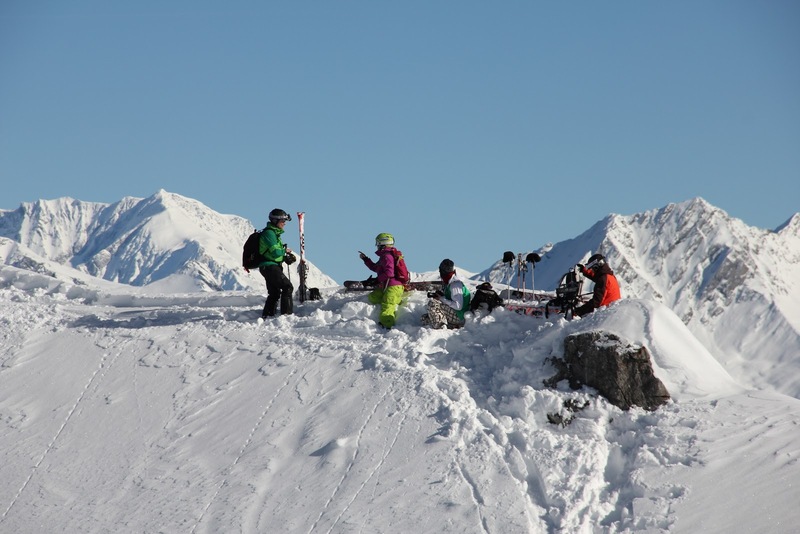 The ski area consists of the upper and lower bowl areas where a majority of the ski runs are, and the headwall and north face areas where most of the interesting extreme skiing is at. Unfortunately, the latter two areas were not yet open on the early days of the season. The direct runs on the north face seemed skiable and I did consider skiing them on my last day, just to limit the damage from that eventual pulling of my lift ticket if the snow patrol would catch me. But I decided against it, mostly because I was alone, and because route finding through the woods seemed challenging. 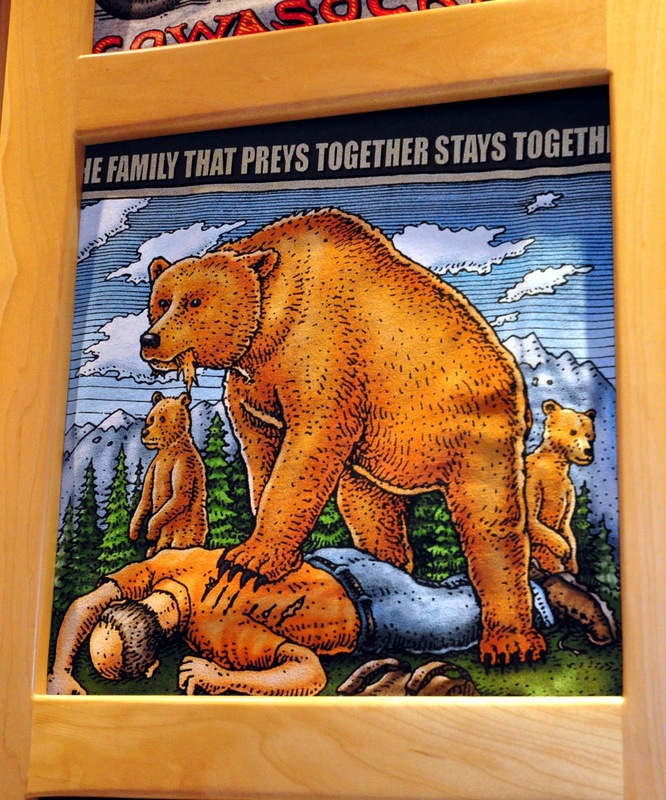 And because of the bears. 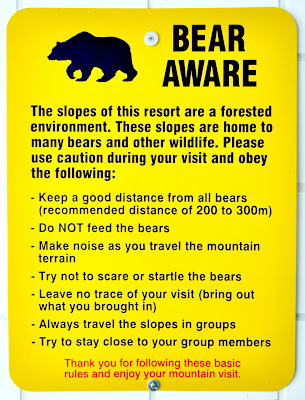 The sign at the base warned against skiing closer than 300 meters to bears. I did not want to hit a bumb on that run and wake up a bear sleeping underneath. Even so, the open areas provided some excellent skiing as well. 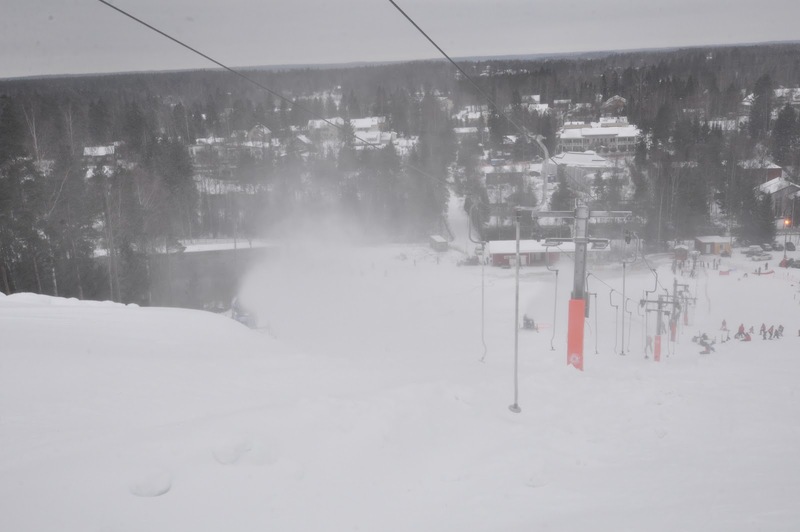 The lower bowl is mostly traditional ski slopes cut through the woods, although there are a couple of areas where you can ski through the wooded areas as well. Good skiing, excellent snow, but nothing special. The upper bowl, on the other hand, offered very interesting skiing through the cliffs and steep bush areas around Chair 6. Oddly enough, there are plenty of short, marked couloir black diamond runs in the area that is marked as blue in the ski area map. This is an area where the powder stayed on for the longest time. 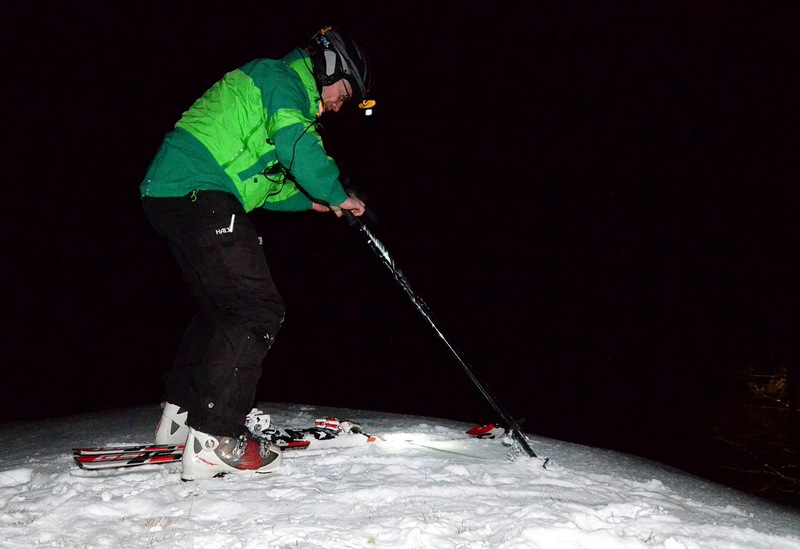 But it also challenges both your skiing and route finding abilities. Route finding was made more difficult due to the sometimes cloudy weather. 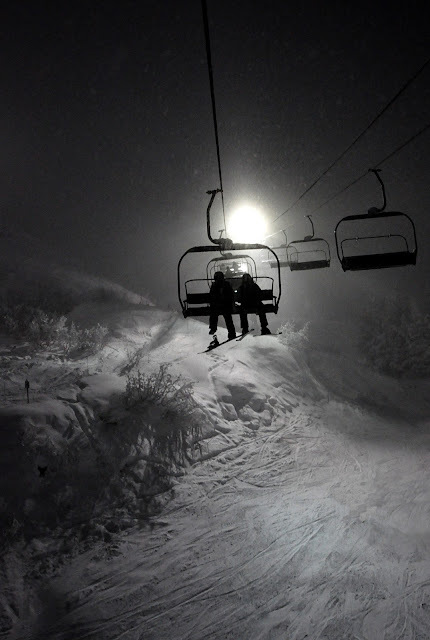 Strangely, the area was easiest to ski in the evening, when artificial lightning lit up the slopes. Skiing in Alyeska reminded me of skiing high up north in Finland. It is very cold and dark. 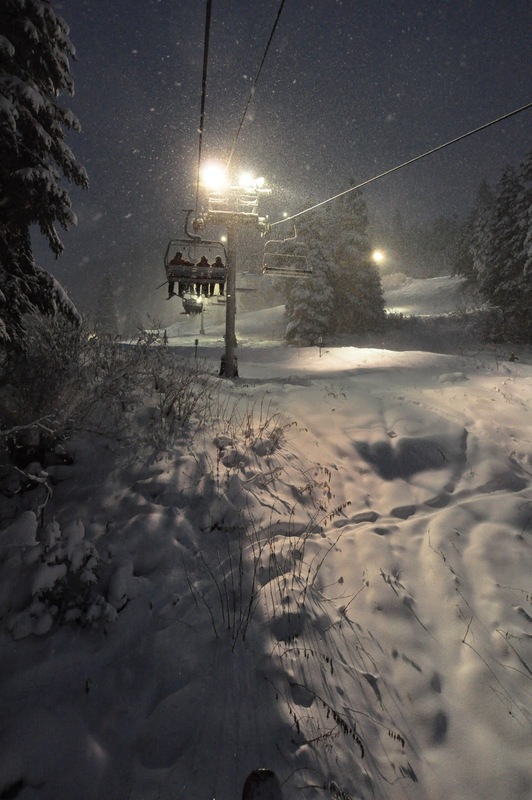 The first lift runs at 10 AM when it is becoming lighter and warmer, but they run all the way to 6 PM on artificial light. The base elevation at Alyeska is only 76 meters. 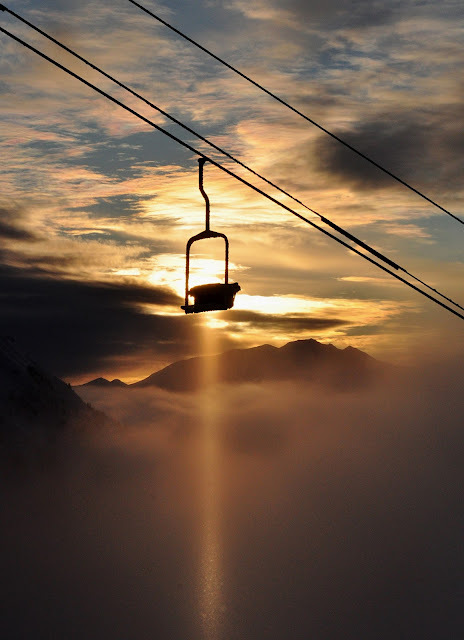 The highest ski lift, Chair 6, takes you to 840 meters. 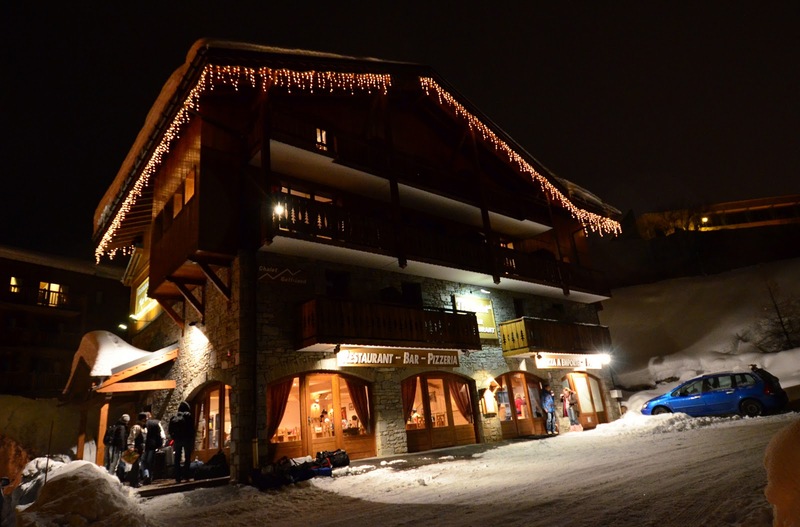 There are only a few accommodation options in the village. 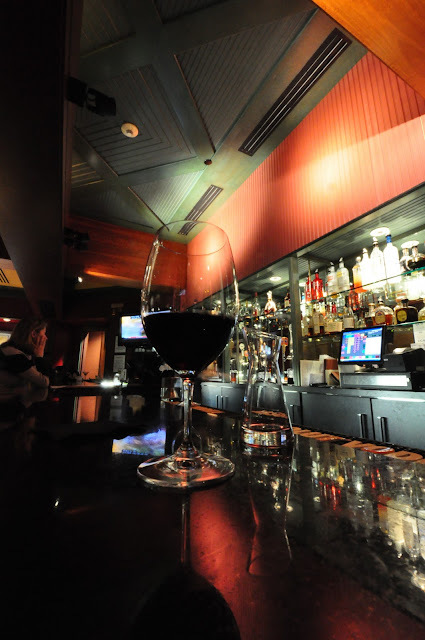 For convenience and to relax after arduous meetings, I chose to stay at the main hotel, Hotel Alyeska. This is a great location, as you can walk straight to the gondola from the hotel and the main restaurants and bars are inside. However, it is also very expensive. But it is a five star facility, my room was better than almost any other hotel room I've been at in the western world. Maybe from that perspective 140$ per night was not that excessive. Luckily I stayed only a couple of nights. For comparison, I am going soon to Les 3 Vallees with friends from work, and we are paying roughly the same sum for the accommodation per week as I was paying here per night. Transport from the airport to the ski area is not very convenient, because of the long way and because the only available options are rental cars and taxis. 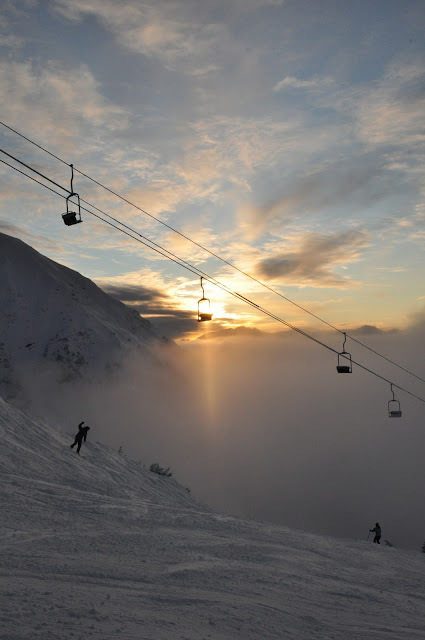 One way taxi fare to Alyeska is 90$. 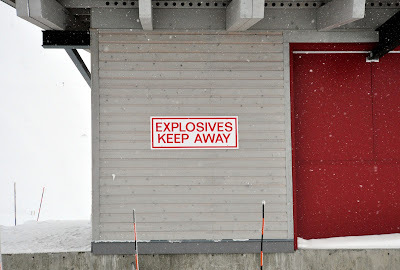 There seemed to be an excessive number of accidents in the ski area. 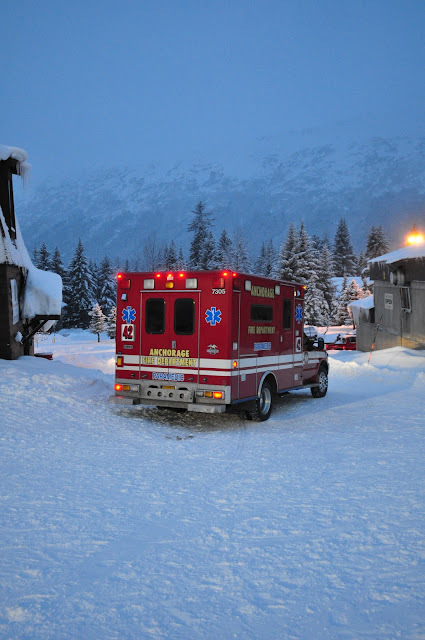 Almost every time I got out of the ski lift, the patrol was taking yet another rescue sled into use. This seemed to be mostly some people who did not know to ski at all, perhaps the opening days and the thanksgiving weekend had something to do with. And despite a relatively small number of people on the mountain, there were a few bottlenecks where reckless speeding had caused accidents. Hopefully no one was seriously injured, however. And the patrol was taking their job very seriously, one one of the bottlenecks they had several people checking skier speeds and warning the ones that were skiing too fast. 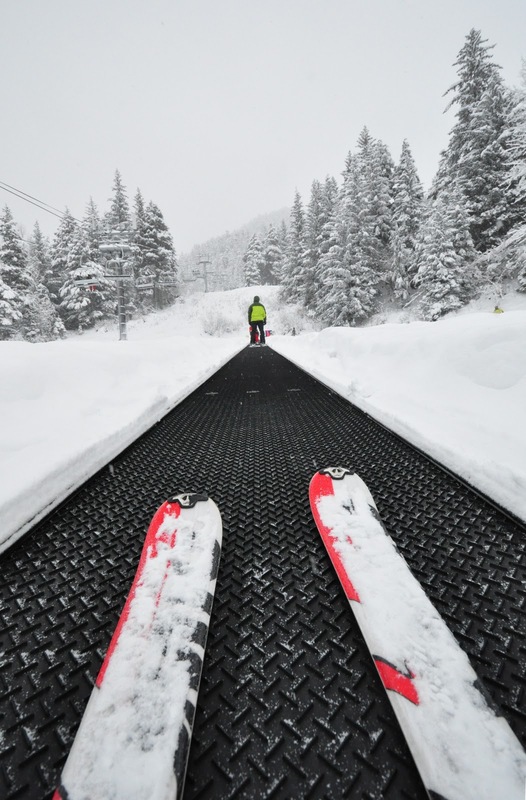 I wish more ski areas did that. 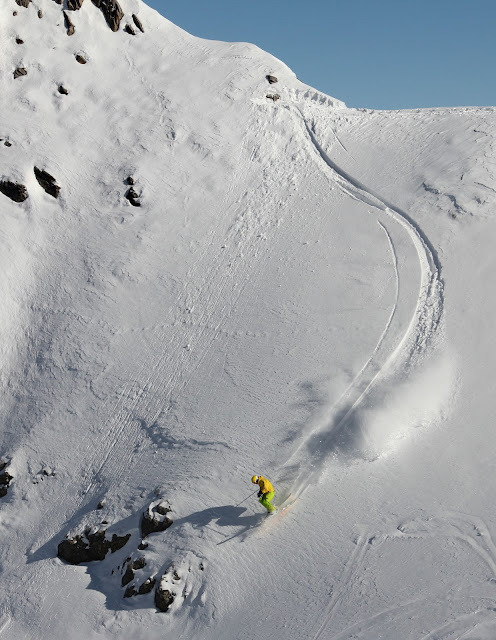 In the winter months Chugach Powder Guides runs a heliskiing service around Alyeska. Similarly, there are organized snowcat tours. These services can be week-long dedicated trips, or day trips where you stay at the resort otherwise. As is usual in North America, the prices for these services are exorbitant. You have to be rich to afford to pay 5 000$ to 10 000$ for a week of heliskiing, or 1000+$ for a day trip. Read my future blog entry to find out where to go in the world to do the same at a fraction of this cost. Alcohol freezes beyond this point? I rate Alyeska as one of the great ski destinations in North America. Not at the same level as Whistler-Blackcomb or Jackson Hole, but certainly comparable to Snowbird, Squaw Valley, Breckendridge and many other well known places. The long travel is an obvious downside. And Alyeska is only one lone area. If you get bored in Snowbird (but why would you?) you could drop by neighboring Alta. 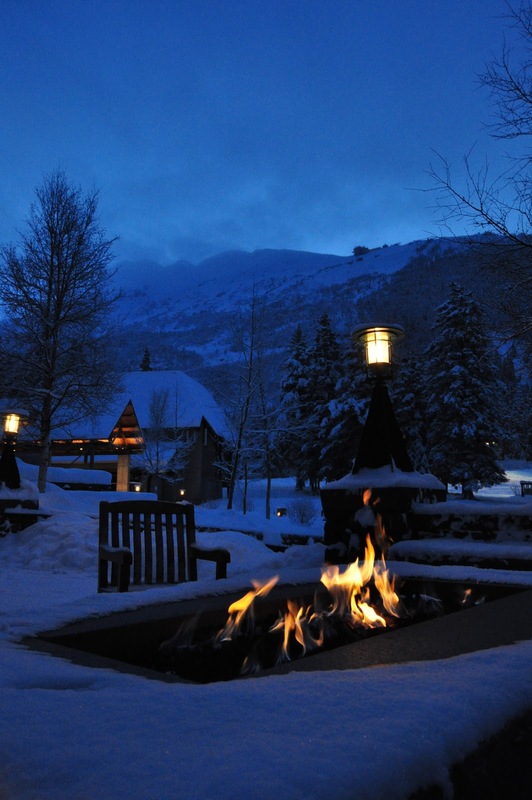 There is no such option in Alyeska. And based on my experience with skiing in Northern Finland, it is probably similarly cold in the middle of winter in the Alyeska. 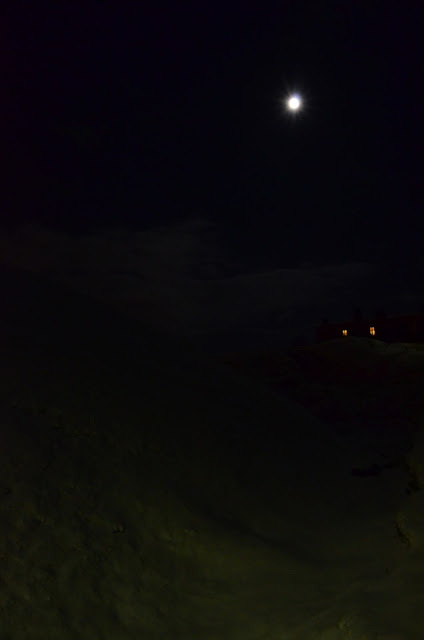 It is cold and dark in Alaska. Very cold. Plenty of snow, through three seasons. Enough challenging terrain, and easy access to double black runs. Also plenty of intermediate and beginner ski runs. The best snow cat, ski touring, and heliskiing options in Northern America. Lifts, hotels and other facilities that are of excellent quality, second to no one else on this continent. The weather, nature, and feeling in this place is different from most other places in North America. You really feel you are far in the north. Still, as I was visiting Alyeska I only met Alaska locals. I did not even meet anyone out of state, let alone anyone from some other country. 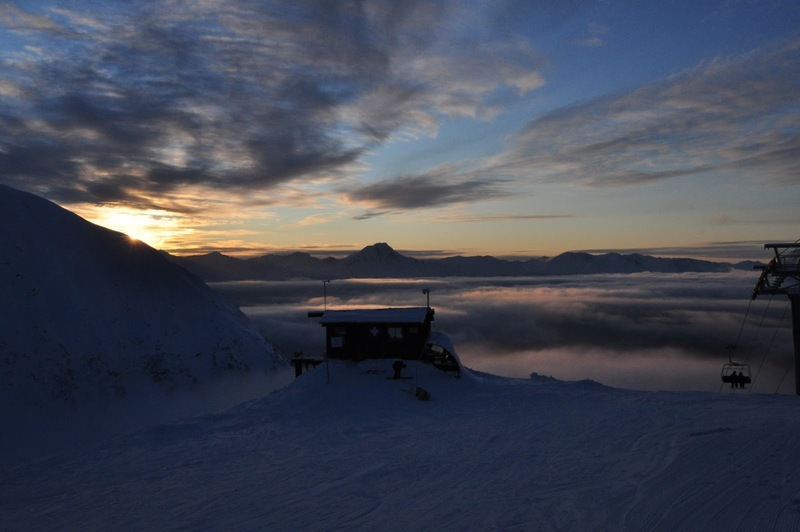 Alyeska is the undiscovered gem of North American skiing. Do visit it some day. 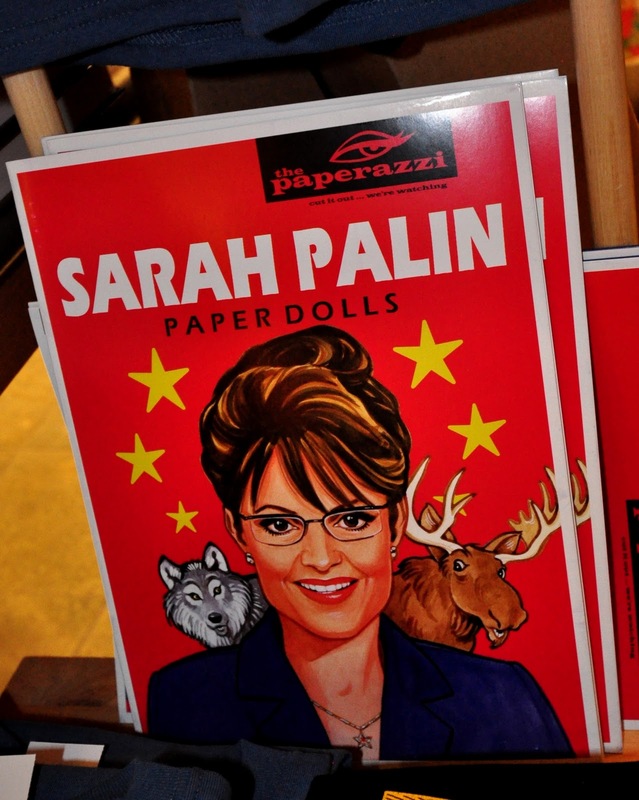 Sarah Palin paper dolls. Recommended souvenir from the Anchorage airport. Alaska. They have humor, too.